The high-tech camera system aboard the Saturn-bound Cassini spacecraft, snapped several pictures as it approached the Moon on its fly-by of planet Earth. The pictures were taken about 80 minutes before closest approach, on August 17, 1999, from a range of about 234,000 miles. 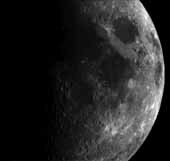 The 80-millisecond exposure from the spacecraft's narrow-angle camera shows lunar features as small as about 2.3 kilometers (1.4 miles) across. Cassini received a slingshot power boost from Earth's gravity field as flew more than 700 miles over the Pacific ocean. Cassini will fly past Jupiter late in 2000 and arrive at Saturn early in 2004 where it will begin a four year long mission studying the Saturian system. The following images and animations are the first images taken for scientific and scenic purposes.